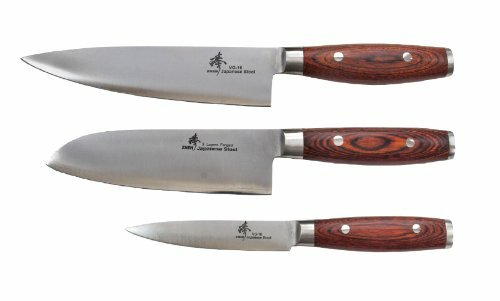 This ZHEN VG-10 3-Layer Forged Steel knife set includes 1 Chef Knife, 1 Santoku Knife, and 1 Utility Knife. The blades are made of 3 layers Japanese forged steel with a VG-10 steel cutting core at HRC 60-62 hardness for durability, exceptional strength, and stain resistance. The full tang handles come in brown color Pakkawood that is non-slip, bacteria resistant, easy to clean, and waterproof. A mirror polished steel bolstering completes these essential kitchen cutlery pieces. Every ZHEN knife comes inside a handcrafted box or storage box perfect for displaying or gifting. *DO NOT chop bones or use on glass, tile, or granite cutting boards. Hand wash with gentle dish soap, rinse, and towel dry immediately. We recommend sharpening ZHEN knives on a whetstone at a 15 degree angle. Limited lifetime warranty against defects, 100% satisfaction guaranteed. Our knives are made from imported Japanese steel and expertly crafted in our ISO 9001 certified Taiwan factory.